Magatama tofu (勾玉豆腐) - served on the side in a cup. 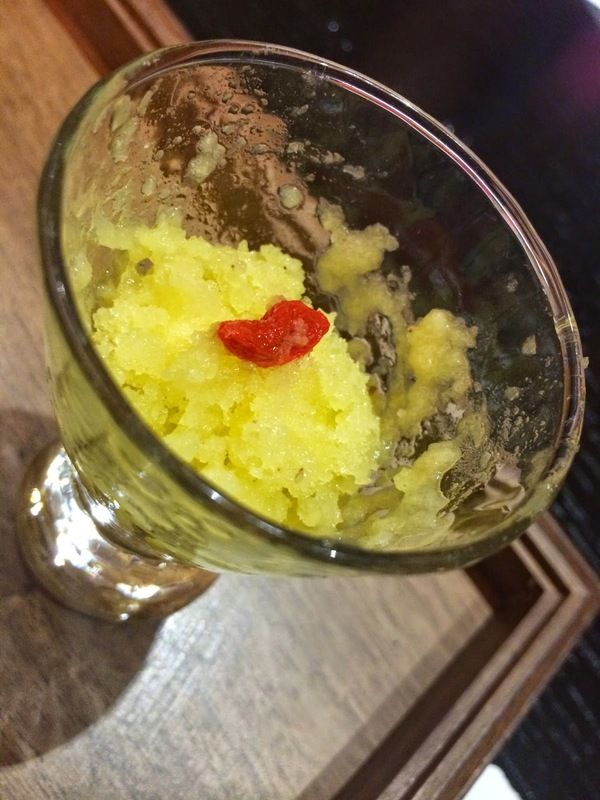 This was made with cashew nuts, which would explain its sweetness, tempered by some wasabi and dashi (出汁) jelly. Basically a very thick mousse in terms of texture. 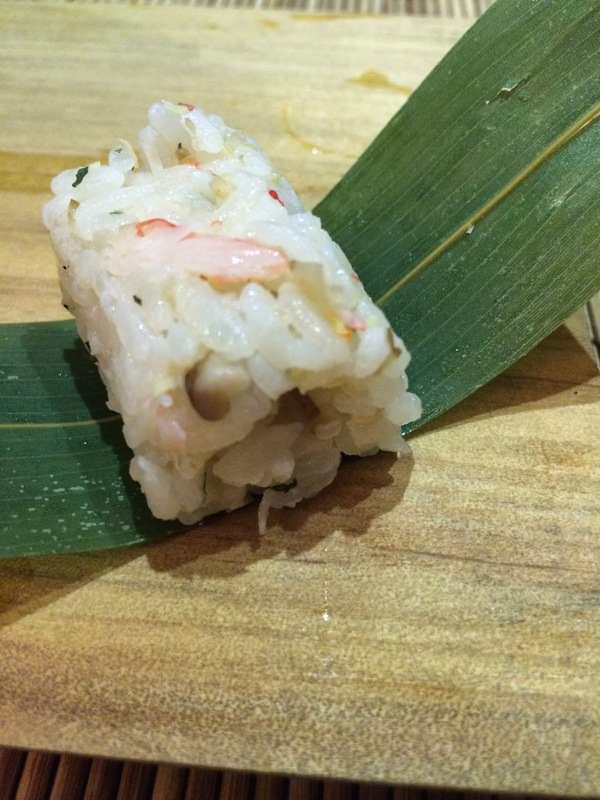 Matsuba crab pressed sushi (松葉蟹箱寿司) - wrapped in a leaf with burdock and ginger. Very bland. Purple yam (紫芋) - with winter melon sugar (冬瓜糖) on the outside. Leafy amaranth (莧菜) - with fried crushed peanuts, but I found it a little bland. Myoga (茗荷) with scallop mousse - the myoga seemed lightly pickled and stuffed with a delicious mousse made with scallops. Deep-fried yam dumpling (芋団子揚げ) - supposedly made with duck from Yilan (宜蘭) but there were only a few shreds and didn't really provide much flavor. Deep-fried bamboo shoot (筍揚げ) - this really was the tender tip of the shoot. Pumpkin and red sea bream dumpling and grilled sea bass (椀物 南瓜しんじょと鱸塩焼き) - the pumpkin and red sea bream dumpling was very soft, fluffy and yummy. Covered with a very thin sheet of radish, a sprinkle of very young pea shoots and a small piece of yuzu (柚子) rind for fragrance. The grilled sea bass had thin strands of carrots on top. 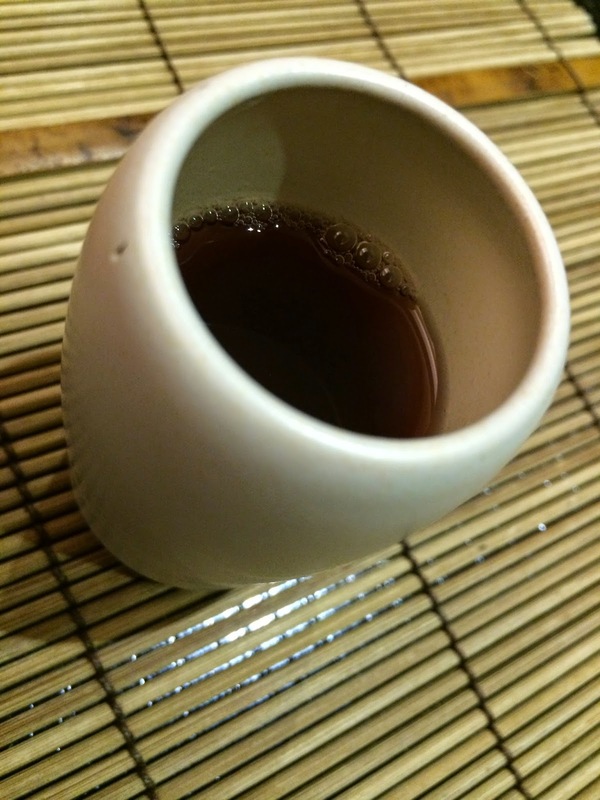 All in a light broth made with dashi (出汁). Six types of seasonal sashimi (造り 旬の魚６種盛り) - salmon (鮭), great amberjack (間八), chicken grunt (鶏魚), needlefish (針魚), sea urchin (雲丹). I gave away my piece of fatty tuna (トロ) as per usual practice. Salmon and pomelo salad (旬肴 秋鮭と文旦のサラダ仕立て) - with pea shoots, perilla flowers, red capsicum, king oyster mushrooms, toasted almond slices and a little bit of caviar on top. Deep-fried cherry salmon (揚物 山女魚唐揚げ トリュフ餡) - this was really, really good. The fish was very tender inside, with a nice glaze was made with dashi (出汁). I ate all of it, including the crunchy bones and head. This actually reminded me a little of the sweetfish from RyuGin. 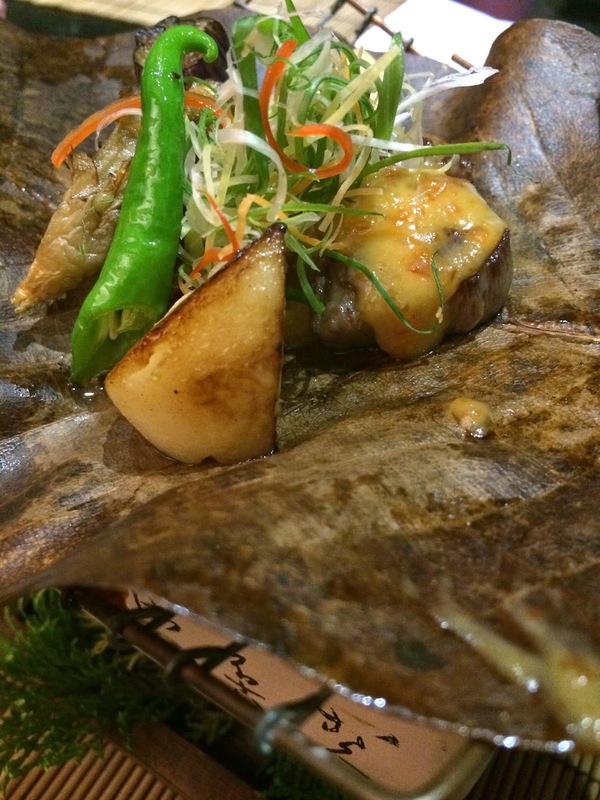 Grilled abalone with cheese (進肴 鮑黄身チーズ焼き) - this was lit and finished within our view. Cheese and seaweed powder was sprinkled on top, and shimeji (しめじ) mushrooms were mixed in among the slices of abalone, with pickled myoga on top. Interesting that they also had the liver here. The abalone was pretty good, but unfortunately I didn't care for the cheese powder they used... tasted cheap and crappy. Hooba miso style beef (強肴 特選牛朴葉味噌焼き) - a regional style from the Hida area famous for their beef, hooba miso is cooked over the leaf of Japanese bigleaf magnolia (朴の木) to release the fragrance from the leaves. The US Black Angus beef was very, very tender, and not surprisingly the sweetish white miso worked well. There was also peach, maitake (舞茸) mushrooms, eggplant and shishito pepper (獅子唐辛子) on the side. 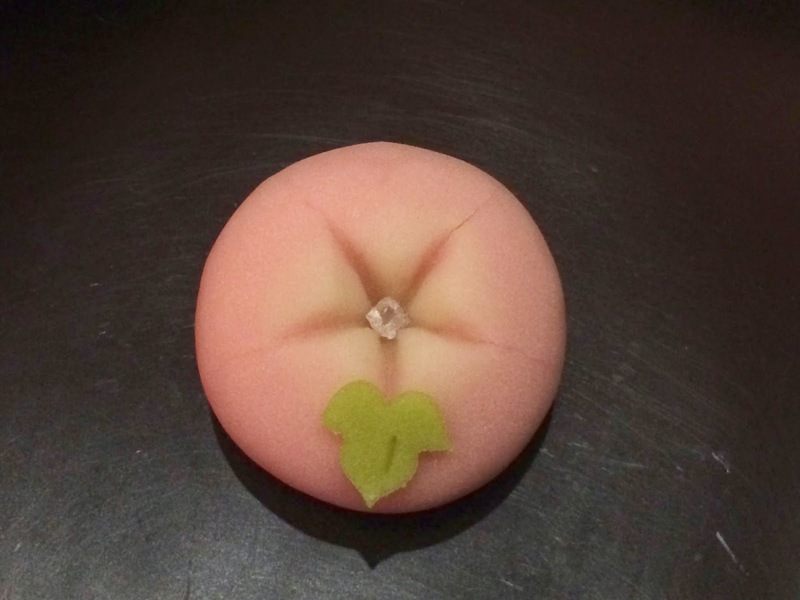 Apple compote with roselle jelly (林檎コンポートローゼルゼリー) - served with what seemed to be almond panna cotta and yogurt, along with blueberries and candied roselle on top. Kintoki sweet potato with fig cream (金時芋無花果クリーム和え) - not a fan, as the acidic cream tasted a little sour and weird. 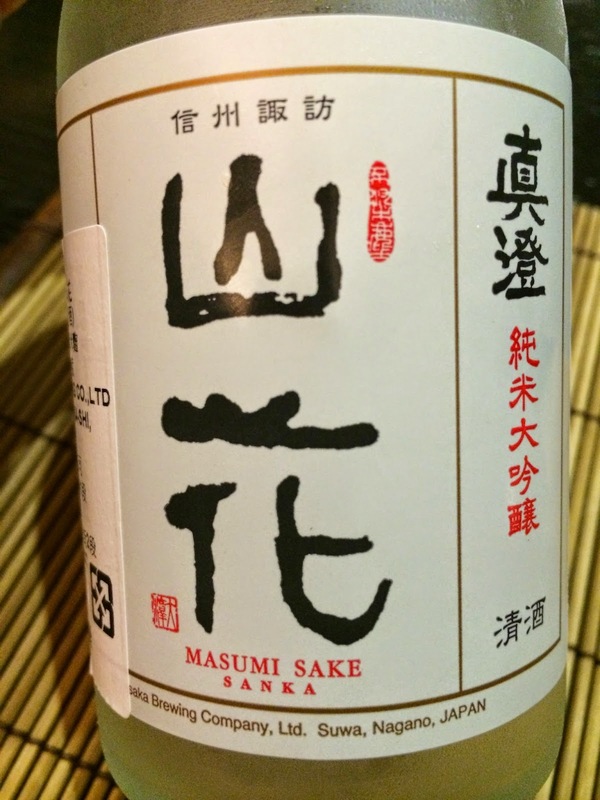 Masumi Sanka Junmai Daiginjo (真澄 山花 純米大吟醸) - we wanted to sip something so I ordered this in a 300ml bottle. Nice and fragrant flavors of fermented rice, with a little banana. Palate was a little drier than expected. This was a lot of food, and once again I felt a little uncomfortable at how full I was, but thankfully this was some really good food. I thought the food was pretty decent on my first visit, but now I think the food is even better. It may not be on par with the best of Japan, but the quality is certainly high, and certainly among the best that Taipei has to offer. Many thanks to Last Minute Uncle for the treat!